For all Club orders within the UK, we use a 1-2 Working Day (when ordered before 12 Noon) service (excludes weekends) with the ParcelForce network and UPS networks. Northern Ireland, the Scottish Islands, Northern Wales and Northern Scotland will often be 2 days and premium service a.m deliveries cannot unfortunately be met by UPS in these areas. The charge for this premium delivery service is only £5.95 per order. You will receive an email from either UPS or ParcelForce on the evening of dispatch with your tracking number and full tracking facilities on this service. Please note to check your spam/junk email if you do not receive your tracking details from UPS or ParcelForce. We have opted against offering a lower priced, slower inferior service, to give you complete satisfaction in receiving your goods quickly and without hassle. We will contact you via phone or email should there be any delay, specified custom orders will take 7-10 working days. We also do not surcharge against any address' in the UK & Great Britain, but charge all UK & Northern Ireland residents the same price regardless of location. On rare occasions approx 1 in 100 UPS or ParcelForce will fail for numerous reasons. These failures can be both in and out of their control to meet its next day promise. 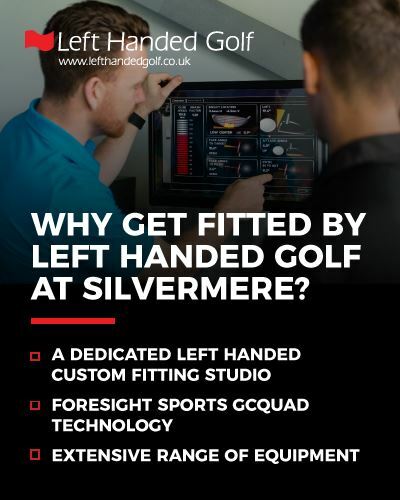 Left Handed Golf Ltd bears no liability in any costs incurred due to delays in delivery with our chosen courier with the exception of a full refund of the carriage charged. At times, low stock levels could result in your order being met by our sister company DMGS (www.silvermeregolfstore.com). In this case your order will be fulfilled and shipped from them.